Tragedies often struck completely out of the blue and devastate not only the affected individuals but also their families. In the US alone, the government is in the possession of $23 billion of unclaimed funds left after events like this. In Canada over $7 Billion of unclaimed assets and the U.K. over $110 Billion. 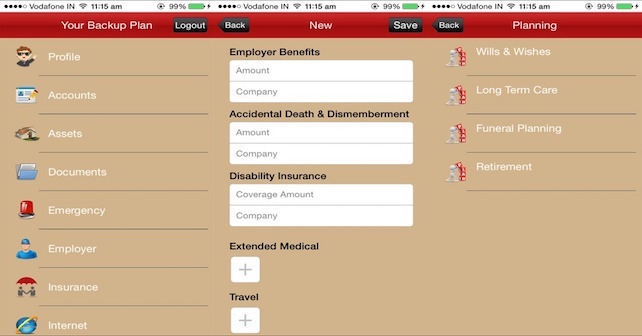 In the uncertain world of today, it seems that the chances of this scenario are becoming greater with each passing day, but thanks to an innovative app called Your BackUp Plan, there is a way of making sure that a person’s family is taken care of. Millions of family members remain unaware they're entitled to collect unclaimed assets owed to deceased relatives, who passed on without leaving updated financial records for their heirs. Even when you go through the ease of the App you will notice, even for yourself, that you might even have unused bank accounts in other institutions or accounts left open for transfers or investments not regularly used. The majority of this lost money comes from dormant bank accounts, orphan pensions, unknown windfalls, shares, bonds, dividends, forgotten life insurance policies, certificates and premium bonds, which have not been redeemed. With huge amounts of time and effort tracking down missing documentation, even funeral arrangements but can sometimes only lead to hitting brick walls when you have to deal with the corporate world. So solutions of course are, leaving information for either yourself or your family members. What better way in a safe and secure environment such as an App. A Top Tier App Review Company, Iphone Apps Review Online says "The app represents a place where a person’s important data can be stored and recovered in an event of a tragedy. As a backup system for essential information, the app is a small piece of mind for anyone who wants to be sure that their family will get back on their feet even if they are taken away from them. More impressively, the app provides this possibility using a simple iPhone." "The app functions in an intricate but very usable way. Inside of it, the person’s record of all important elements of their life is stored. These include financial statements, loans, savings, property possessions records, but also computer passwords, account names, important numbers and all other relevant data that could mean a world of difference if a person becomes injured, sick or passes away. All of this is stored away in the user’s iPhone using this backup app." says,www.iphoneappsreviewonline.com. Whether it is a tragic accident, injury or emergency or even a natural disaster, there will be a solution to you needing that information quickly and without added emotional stress. "Thanks to an innovative idea that has a lot of real-life value, this app presents a resolution to an issue many people fear might occur. By being prepared for any form of tragedy, the app could be the most important one a person ever installed on their phone device." says, www.iphoneappsreviewonline.com. Tina Olexa is a sole Developer and Designer of Your Backup Plan. Her passion for reaching out to people and changing their lives with a simple to use plan. The App has been released and is available on iTunes and the Google Play Store.